The worldwide wearables market showed continued growth in the third quarter of 2017, up 7.3 percent over last year, according to International Data Corp. The market research firm has also noted a growing trend toward smart wearables, defined as devices capable of running third-party applications. Basic wearables, on the other hand, are on the decline. 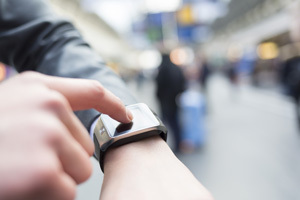 "The differing trajectories for both smart and basic wearables underscore the ongoing evolution for the wearables market," said Ramon Llamas, research manager for IDC's wearables team, in a statement. "Basic wearables — with devices coming from Fitbit, Xiaomi and Huawei — helped establish the wearables market. But as tastes and demands have changed toward multi-purpose devices — like smartwatches from Apple, Fossil and Samsung — vendors find themselves at a crossroads to adjust accordingly to capture growth opportunity and mindshare." Case in point: While Fitbit tied (with Chinese company Xiaomi) for first place in market share in 3Q17, it took a big hit in year-over-year growth, falling by 33 percent. In contrast, Apple logged more than 52 percent growth over the same period. "Apple's results reflect the timing of its product refresh late in the quarter and this was evident in the overall shipment increase as the release of its Watch 3 was enough to buoy volumes and remain ahead of the competition," IDC explained in a news release. "The introduction of a cellular-connected version should spur interest from would-be purchasers going forward, and its slow and purposeful approach to cellular-enabled capabilities (including voice, data and streaming music) will give users time to acclimate to a smartphone-free experience." For more information on IDC's Worldwide Quarterly Wearable Device Tracker, visit the IDC site.